Large private room only a couple of mins walk from Acland St bars and St Kilda beach. All bills included. You'll have a queen size bed in a beautiful, fully-furnished apartment with your own TV and NetFlix, unlimited internet, access to a fully-stocked kitchen, bathroom and laundry. Shared areas are cleaned on a regular basis so your stay is hassle-free ;) All bills are included. Singles are $350 per week and couples are $450 per week. 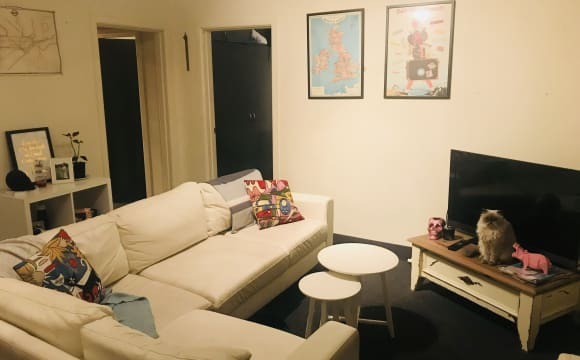 Room available in St Kilda from 4th May on the doorstep of the amazing Chapel St lifestyle * Month by month lease, you must go on the lease * Rent $280 p/w / $1151 per month * Standard bills not included and split 50/50 * No couples or pets sorry Location - the best of all worlds! 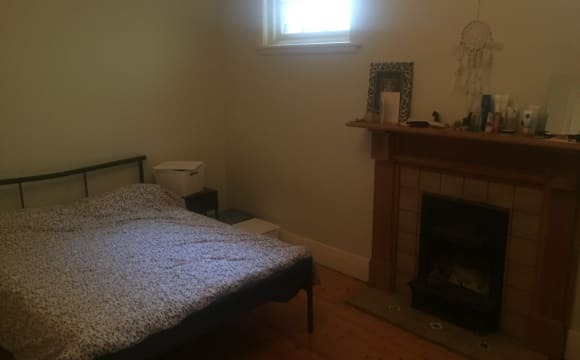 * 300m walk from Windsor train station * 200m walk to trams to the city * Chapel St on our doorstep * St Kilda / Elwood beach 10 minute drive * Albert Park 5 minute drive * Prahran Markets 15 minute walk About the house: * 2 bedroom x 1 bathroom house * Furnished house except your room * Cute porch at the front * Bedroom available is 3.5m x 4m with huge ceilings, plenty of wardrobe space and natural light * Shared bathroom with separate shower and bath * Living room has air con. House gets quite cold in winter, but floor heaters and a few layers suffice * House has been divided and there are neighbours in the other half under the same roof which we share walls with so you will hear some noise and movement * Shared backyard with neighbours * Free street parking Ideal housemate: I’m looking for someone 26-30 years old who works full time and lives an active lifestyle. Easy going personality and has a good balance of independence and social life. I'm always keen to have TV nights at home, or head to the local pub for a meal but equally love my dose of independence If you are keen please send me a message with some info about yourself, move date and what you are looking for in a share house. 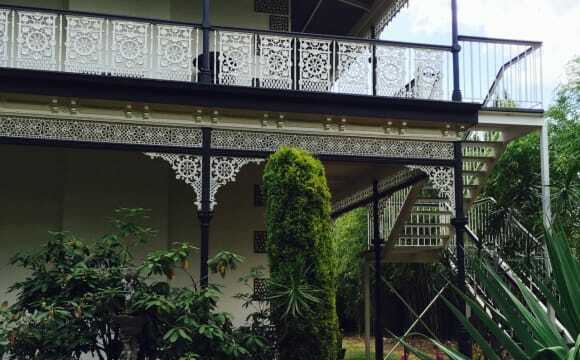 Gorgeous 1860's heritage listed building on the border of St Kilda and Elwood. Perfect for a couple or single person. We have a security entrance and lovely gardens surrounding the building - front and back garden with outdoor seating and a huge patio as you enter our apartment, perfect for relaxing. Once inside our apartment you will be impressed by the 12ft high ceilings and spacious rooms: entrance hall, lounge, dining, kitchen and meals, large bathroom and 2nd toilet. This is a 3 bedroom apartment and with so many living spaces you will never feel as tho you are living on top of your other flatmates. The location is amazing, with 2 train lines within a 10 min walk (St Kilda's Ripponlea and Balaclava Stations), Acland St, Chapel St and Brighton Road Trams 1 - 10 min walk, and 10 mins walk to the beach and St Kilda Botanic Gardens. 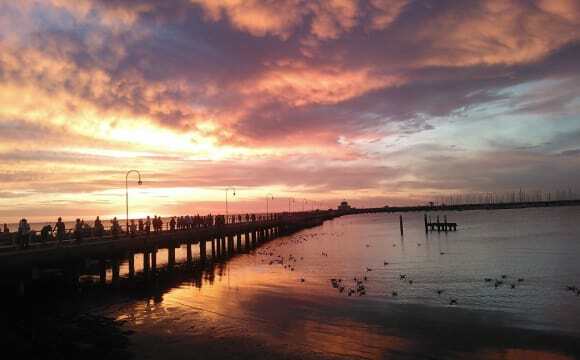 Close by to everything St Kilda and Elwood have to offer. 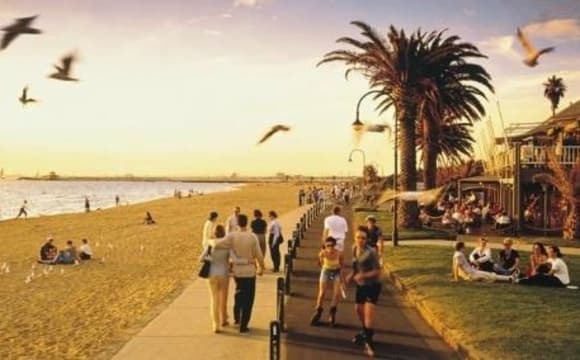 You are close to the beach, the trams, trains, shops, bars, cafes and a hop skip and a jump to St Kilda and not far from the city. You would be sharing with myself (my tabby cat) and one couple. I hope to meet you soon and show you your future home, until then happy house hunting! Amenities, Parks, View, CBD near by, Freeway to the airport, Art Centre, Theatre, Flinders Station, Yarra River, Trams Stop. Everything at our doorstep is terrifically convenient!! SPACIOUS 3 BEDROOM APARTMENT Room 1 GREEN: Large Private Single Room with a Queen Size Bed Room 2 RED: Large Private Single Room with a Queen Size Bed Room 3 YELLOW: Twin Room with 2 x Single Beds. 4 PERSON HOUSEHOLD Suit: Those on Working Holiday Visas FULLY FURNISHED including: *Fully Equipped KITCHEN with FULL-SIZE STOVE/OVEN *2 x LARGE FRIDGES *DINING ROOM - Separate *LOUNGE ROOM - Large and comfortable *COMPLETE BEDDING *COMMUNAL REAR GARDEN SETTING (Good for smokers) On Inkerman St, St Kilda Close to: *ALDI FOOD STORE *TRAMS 3 and 67 from Stop 34 along St Kilda Rd (20 Mins to CBD) *ACLAND St Shops, Cafes, restaurants, and bars *LUNA PARK *ST KILDA BEACH *FITZROY St Bars and Restaurants *Albert Park Lake *CARLISE ST Restaurants, Bars, and Cafes. EASY TERMS: *DEPOSIT/BOND = 1 Week's Rent *RENT Paid Weekly (preferably online) *MINIMUM STAY - One Week *NOTICE TO VACATE - 7 Full days *BILLS Included (gas, electricity, water) *"NO PARTY POLICY" Applies Please Quote: "Flat Code: i2"
CLEAN, SELF-CONTAINED STUDIO APARTMENT Ideal for BACKPACKERS with WORKING HOLIDAY VISAS FULLY FURNISHED including: KITCHENETTE - Fully Equipped (inc large fridge) QUEEN-SIZE BED with COMPLETE BEDDING BATHROOM - En-suite On Jackson St, close to: * FITZROY ST- Bars and Restaurants * ST KILDA BEACH * ACLAND ST- shops, cafes, restaurants, and bars * LUNA PARK * ALBERT PARK * TRAMS 3A, 16, 96 AND 12 - 20 Minutes to CBD. * BUSES to surrounding suburbs. EASY TERMS: *DEPOSIT/BOND = 1 Week's Rent *RENT Paid Weekly (preferably online) *MINIMUM STAY - One Week *NOTICE TO VACATE - 7 Full days *BILLS Included (gas, electricity, water) *"NO PARTY POLICY" Applies Please Quote: "Flat Code: J13"
STUDIO APARTMENT Suits: BACKPACKERS ON WORKING HOLIDAY VISAS FULLY FURNISHED including: *KITCHENETTE with FULL-SIZED GAS STOVE/OVEN, LARGE FRIDGE, and all kitchenware *BEDS with COMPLETE BEDDING (Can be swapped to suit) *ENSUITE BATHROOM with Continuous Hot Water. 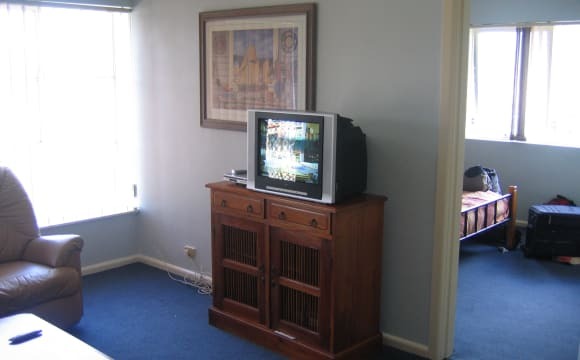 *TV, DVD On JACKSON ST - close to: *FITZROY ST Nightlife *LAUNDRETTE 100m away in the same street *ST KILDA BEACH *ACLAND ST Shops, Cafes, Restaurants, and Bars *LUNA PARK *ALBERT PARK LAKE *TRAMS: 12,16 and 96 *BUSES. EASY TERMS: *DEPOSIT/BOND = 1 Week's Rent *RENT Paid Weekly (preferably online) *MINIMUM STAY - One Week *NOTICE TO VACATE - 7 Full days *BILLS INCLUDED (gas, electricity, water) *"NO PARTY POLICY" Applies Please quote: Flat code "j5"
Room 1: LARGE ROOM, with BUNK + SINGLE BED Room 2: DOUBLE ROOM, with QUEEN-SIZE BED Within a FULLY FURNISHED Two Bedroom Flat SUIT: TRAVELLERS on WORKING HOLIDAY VISAS Includes LARGE BUILT-IN WARDROBES AND Chests of Drawers, COMPLETE BEDDING KITCHEN: FULLY EQUIPPED with full-size GAS STOVE/OVEN, LOUNGE ROOM is clean, light and airy. TV/DVD WASHING MACHINE in Communal Laundry. Coin operated $3. On INKERMAN ST across from the ALDI FOOD STORE. Close to Carlisle St Balaclava Fresh Food Shopping Precinct. Walking distance to Chapel St, Acland St, and Fitzroy St. Short walk to BALACLAVA STATION (Sandringham line -15 minutes to Flinders St Station) and TRAMS 3 and 67 from St Kilda Rd. EASY TERMS: *DEPOSIT/BOND = 1 Week's Rent *RENT Paid Weekly (preferably online) *MINIMUM STAY - One Week *NOTICE TO VACATE - 7 Full days *BILLS Included (gas, electricity, water) *"NO PARTY POLICY" Applies * "NO PARTY POLICY" applies Please Quote: "Flat Code: H4"
Room 1: LARGE TRIPLE ROOM with a QUEEN SIZE BED Room 2: TWIN ROOM: With 2 x SINGLE BEDS In a CLEAN. 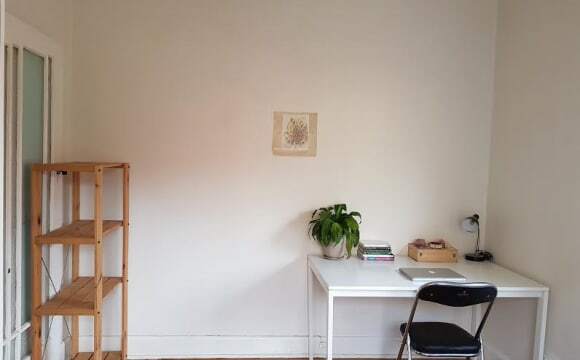 LIGHT, BRIGHT 2 Bedroom Flat Suit: BACKPACKERS on Working Holiday Visas, or similar. FULLY FURNISHED, Including: *LARGE BUILT-IN WARDROBES *KITCHEN with FULL-SIZE STOVE/OVEN and Fully Equipped *SHOWER over BATHTUB *COMFORTABLE CLEAN LOUNGE - Light and airy *WASHING MACHINE in the building - coin operated $3. On INKERMAN ST Across from the ALDI Supermarket. Close to: CARLISLE ST Balaclava Fresh Food Shopping Precinct. TRAMS 3 and 67 from St Kilda Rd BALACLAVA STATION (Sandringham line -15 minutes to Flinders St Station) Walking distance to CHAPEL ST, ACLAND ST, and FITZROY ST. EASY TERMS: *DEPOSIT/BOND = 1 Week's Rent *RENT paid weekly (preferably online) *MINIMUM STAY - One Week *NOTICE TO VACATE - 7 Full days *BILLS are included (gas, electricity, water) *"NO PARTY POLICY" Applies Please Quote: "Flat Code: H3"
king size room available with it's own bathroom, in this large (130sqm) 2 level open space warehouse apartment with high ceilings, close to all forms of public transport. Near to the Carlise st shops (Balaclava) and all its great eateries. As well as many local bars and parks. There is also the ability for a council permit for on street parking which is increasingly rare in the area. The property is furnished. The room can be furnished or unfurnished. 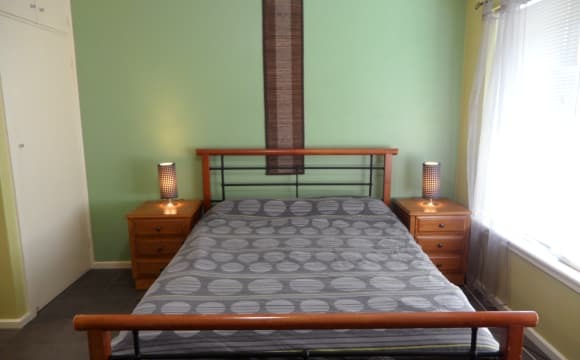 LARGE DOUBLE ROOM with QUEEN SIZE BED ($380 per week) In a CLEAN, ATTRACTIVE 2 BEDROOM FLAT Suit: a COUPLE - with WORKING HOLIDAY VISAS. Short-medium term stays (typically 1-6 months) FULLY FURNISHED KITCHEN - with MEALS AREA Full-Size STOVE/OVEN and Microwave Oven LARGE FRIDGE LOUNGE AREA - Clean and Comfortable BEDS and COMPLETE BEDDING COMMUNAL COIN LAUNDRY - $3 wash On CARLISLE ST St Kilda Close to ACLAND ST, FITZROY ST and St KILDA BEACH Short walk to Balaclava Fresh Food Shopping Precinct and BALACLAVA TRAIN STATION TRAMS: 3,16 or 67 (20 minutes to the city) EASY TERMS: *DEPOSIT/BOND = 1 Week's Rent *RENT Paid Weekly (preferably online) *MINIMUM STAY - One Week *NOTICE TO VACATE - 7 Full days *BILLS Included (gas, electricity, water) *"NO PARTY POLICY" Applies Please quote: Flat Code "CARL"
St. Kilda Share Room - Perfect for 2 travelling friends!! 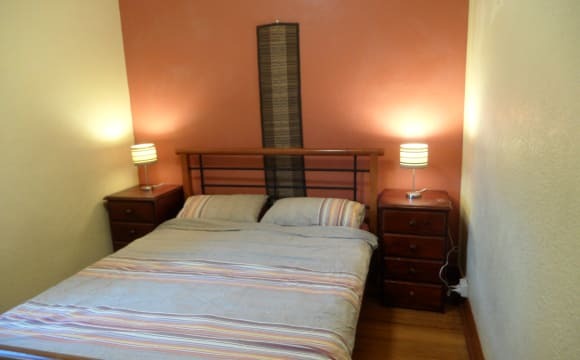 Large private room in shared apartment comes with 2 single beds, walk in wardrobe, desk, tv and very own private balcony. Close to trams - one minutes walk to tram stop, then twenty minutes to reach the city. Five minutes’ walk to supermarket, ten minutes to the beach - great for summer! 2 bedroom apartments is shared with an Australian guy and his dog - fairly quiet but friendly and sociable. Enjoy a drink on weekends but work hard during the week. $200 per person per week with all bills included - ADSL2 wifi throughout. Perfect for single or 2 friends travelling - long term or short term welcomed. Send me a text or an email if you'd like to see the place. If you call and I don't answer, I'm probably driving or at work - send me a text instead. Cheers! Location location location - tucked away in a quiet and secluded block you’d never think you were 5 minutes stroll from the hustle and bustle of acland street and St Kilda Beach. The apartment is cosy and homely with a cute courtyard. The bedroom has a queen bed, built in robe and a full length mirror. Mi cassa su cassa - looking for a housemate whose going to make this house their home. Recently renovated terrace house equipped with all amenities. Quiet street located opposite a park with BBQ's, basketball ring and playground. Plentiful on-street parking. 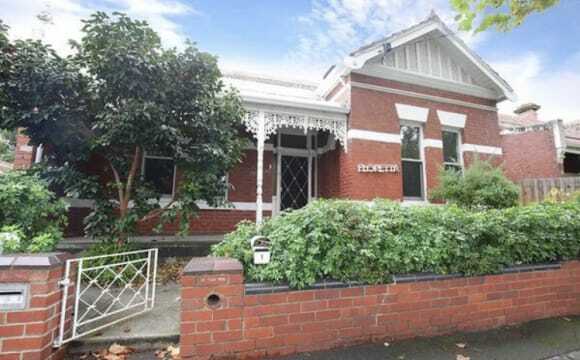 Approximately an 8-10 minute walk to Balaclava train station or a 2 minute walk to Trams on St Kilda road (city bound or south bound) - Full ducted heating and A/C in main living areas, dishwasher, gas cooker, 60" flat screen TV and unlimited internet. 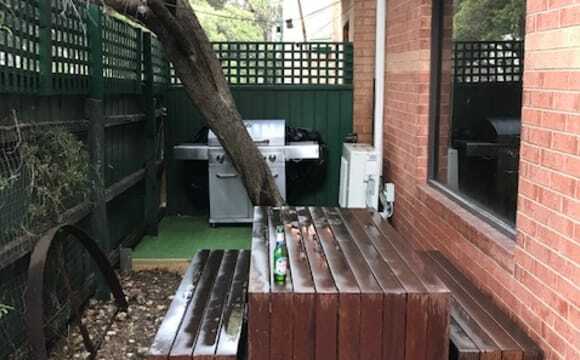 Great private and sunny courtyard including BBQ and access via rear laneway. This private bedroom is fully furnished including a new desk, new double bed and mattress, side table and bedside reading lamp. Conveniently located a 2 minute walk from ALDI supermarket and the post office hotel pub with outdoor courtyard/trivia night, food etc. Room1: LARGE TRIPLE ROOM with 3 x SINGLE BEDS (2 available) Room 2: PRIVATE SINGLE ROOM with a QUEEN SIZE BED In a FULLY FURNISHED S P A C I O U S Two Bedroom Apartment. BATHROOM - Recently Renovated KITCHEN fully equipped incl. STOVE/OVEN, Microwave, Large Fridge etc. COMPLETE BEDDING LOUNGE AREA is large and comfortable COMMUNAL COIN LAUNDRY in rear yard. $4 + $2 + Clothes Line. Lots of garden space with a great communal area in rear yard. 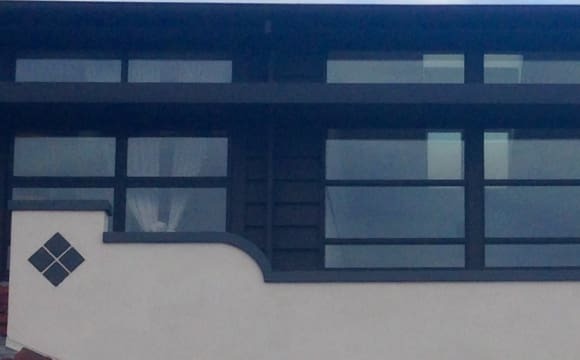 Easy to interact with other travelers living in the same building. On Inkerman Street near St Kilda Rd. Close to: *ALDI Supermarket. *ST KILDA RD TRAMS: 3 and 67. 20 minutes to the city *ACLAND Street shops, cafes, restaurants, and bars *LUNA PARK *ST KILDA BEACH *FITZROY Street bars and restaurants *Albert Park Lake *CARLISLE Street restaurants, bars, and cafes. EASY TERMS: *DEPOSIT/BOND = 1 Week's Rent *RENT Paid Weekly (preferably online) *MINIMUM STAY - One Week *NOTICE TO VACATE - 7 Full days *BILLS Included (gas, electricity, water) *"NO PARTY POLICY" Applies Please Quote: Flat Code "i4"